At least from an American perspective, Iceland doesn’t show up on a lot of peoples’ radar, despite the fact that from Boston it’s only a 4.5 hour flight (making it closer than a substantial fraction of US destinations), and airfares are relatively cheap (indeed, that’s how I first discovered Iceland, since Icelandair is a pretty cheap way to get to Europe, and you break up the trip into two shorter segments). 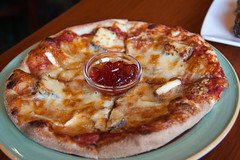 What most people do know is that the country has few trees (true), and very good scenery (very true), and terrible food. The last of these is terribly, terribly false. 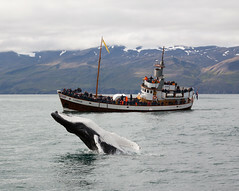 Sure, a few key Icelandic items have a reputation for being foul (oh, the jokes I heard about Brennivin and Hakarl before leaving…), but the real truth of the matter is that I found Icelandic food, particularly fish and lamb items, to be amongst some of the best food I’ve eaten. 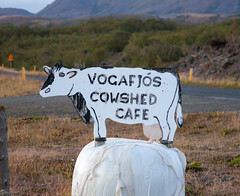 Vogafjós Cowshed Cafe: It’s a cow shed. It’s a restaurant. It’s a B+B. It’s all of these! N1: Icelandic petrol station dining at its finest! On our way back from our recent trip to Montreal, we were fairly hungry as we passed through Southern Quebec and Northern Vermont, which don’t have a lot of options (although Chez Ti Polo in Henryville, QC looks quite promising, I think I will have to check them out next time). One of the first towns encountered crossing back in Vermont is Swanton, so we decided to check out the area. Swanton isn’t a particularly large town. In fact, it’s quite a small town. But it has two prominent places to eat coming into town off of the Interstate: McDonalds, and Shaggy’s Snack Bar. Obviously, we opted for the latter.